I recently spoke with friend, investor, and author Vitaliy Katsenelson, chief investment officer of investment firm Investment Management Associates. Vitaliy is brilliant. I think he's the Benjamin Graham of our generation (and I'm not the first one to say that). I also highly recommend his two books, The Little Book of Sideways Markets and Active Value Investing. The latter is especially deep and insightful, but easy to read. Earlier this year, he and I spent a lot of time talking about the way he applies a specific concept to companies... the idea of "antifragility," drawn from trader and philosopher Nassim Taleb. Take drinking glasses or champagne glasses. You put them in a package. You bubble wrap them as much as you can. You put them in a package and you write "FRAGILE" on it in big letters. Then you pray that the shipping gods take care of them in a very nice way, so they won't be damaged when they arrive. That's fragile. Then you have robust things. Think of this as something made of rubber. You put a rubber object in a package, you shake it and bounce it around, and you don't worry about what happens to it. It won't break. When it arrives, you know it's going to be fully intact. Antifragile is almost like rubber with IQ. It's as if the rubber object gets smarter and stronger from getting beat up. So it applies to companies. Fragile companies, when there's some kind of stressor [like a recession or Amazon competing with them] that comes from outside that breaks those companies, that causes the value of the business to decline, I would call those companies fragile. Vitaliy offered the example of a cyclical company with lots of debt as being fragile. If the economy goes into a recession and the company must issue equity at low prices, it could destroy its own value. As Vitaliy explained, "It doesn't necessarily have to go bankrupt. It's just that the recession or other event causes the value of the company to decline. Not just the stock price, but the value of the business actually declines." When you have a robust company, say it goes into a recession. It comes out as if nothing happened. The value of the business has not deteriorated or increased... the company has neither benefited nor been hurt by a recession. Then we have antifragile companies. This is the one that's most interesting to me. These are companies where they have a very strong business and they have a great balance sheet and they have great management, either the combination of all three things, or at least two out of the three. I think good management is paramount. When [the antifragile company] goes into a recession, because it's the strongest player in the industry, its business is doing fine. Its competitors are suffering. The competitors are fragile, so that company is able to take advantage of its competitors. So maybe it cuts prices and drives competitors into bankruptcy and takes market share, or it buys competitors on the cheap, but it's basically getting a benefit from the stress. After the recession, the antifragile company's earnings power is higher than it was before the recession. It's able to actively take advantage of conditions that weaken its competitors. Vitaliy later added, "To be truly antifragile, you need your competitors to be fragile." I took this to mean antifragility is a relative assessment, not an objective one. Antifragility cannot exist in a vacuum. He offered an example: electronics retailer Best Buy (BBY). "Best Buy was a much stronger, better-run company than Circuit City. And it had net-net benefited from Circuit City going out of business... Best Buy ended up being the antifragile company in that industry because everybody else was fragile." Warren Buffett's Berkshire Hathaway (BRK) has also exhibited antifragility by keeping plenty of cash on hand to take advantage of bad times, like when it bought bonds yielding 10%-15% during the financial crisis, and hundreds of millions of warrants. If you have debt in a cyclical business, those two markers together make it a fragile company. A company that may be cyclical but doesn't have debt may be a robust company. I've been thinking about Vitaliy's idea of antifragile companies ever since our conversation. I see fragile, robust, and antifragile as an attempt to create boundaries along a continuum of risk, with 100% fragility at one end, robustness in the middle, and antifragility at the other end. I don't believe a truly antifragile company exists. For example, Vitaliy identified cyclicality as a weakness, but all businesses are cyclical to some degree. Vitaliy also mentioned recession as a typical stressor that would help differentiate the three types of companies. And again, I don't think a truly recession-proof business exists. A company could do well in one recession and poorly in another. Negative financial advice is the best and most foundational of all financial advice: That is, don't lose money, don't blow yourself up, don't take too much risk, etc. You must heed all the good "negative advice" before you can benefit from any positive advice (i.e. what and when to buy). Your first task as an investor is to identify sources of fragility in businesses and make sure you have minimal (and preferably zero exposure) to them. For instance, Vitaliy identified debt in a cyclical business as a fragile combination. A large debt load in any business that has no pricing power (many of which are highly cyclical) will make a company fragile. Once you've eliminated or minimized fragile companies, you're left with robust companies which may exhibit antifragile characteristics. Sources of antifragility are often limited in time and scope. For example, Best Buy benefited from the implosion of other electronics retailers due to Amazon's influence. But this is likely a one-off opportunity that Best Buy won't be able to exploit again. Overall, you don't want too many long positions in fragile companies (if any). You want to invest in companies that are as far away from fragile as possible: companies with great balance sheets and management teams. As Vitaliy noted, a strong management team is paramount... First, companies are just groups of people, so the people leading them need integrity and competence. Second, once again, every business is cyclical to some degree. Whether a company can benefit from events that hurt other companies depends on how the people in the company (especially those in charge) behave through cycles. No business is completely antifragile. Still, Vitaliy's insight is valuable and downright brilliant. I hope our conversation can help you identify businesses that will succeed when their competitors fail. That's a worthwhile ability, because it can help you know which companies to buy and which ones to avoid. Dan says that a "Golden Age of Value Investing" is about to dawn. And it will be an ideal time to pick up robust businesses that can survive a down market – and thrive over the long term. Get more details here: This Profitable Investing Strategy Is About to Make a Comeback. "A stock isn't a lottery ticket with a price graph attached," Dan writes. "It's a proportional share in the fortunes (good or bad) of a real business." Learn how focusing on the business can give you an advantage right here: Think Like a Business Owner, Not Like a Trader. 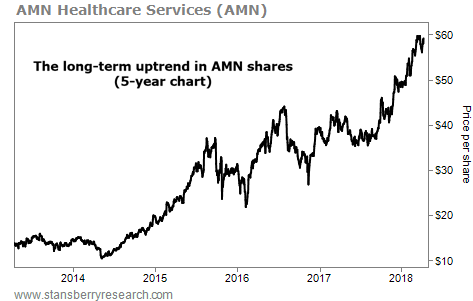 For more proof, we'll look at shares of health care staffing company AMN Healthcare Services (AMN). The $3 billion company handles the hiring needs of hospitals and medical facilities. AMN finds short-term, long-term, and even full-time qualified workers for these facilities. And business is good... Over the past five years, its sales have doubled. And its profits are up nearly 500% over that span.